Audio for today’s show will be available at approx. 3:00 p.m. ET. 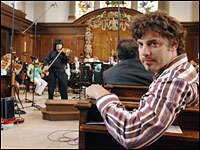 Erran Baron Cohen listens to the Turan Alem Kazakhstan Philharmonic Orchestra as they practice one of his pieces in central London. Fresh Air from WHYY, December 18, 2008 – Composer Erran Baron Cohen’s latest CD Songs in the Key of Hanukkah offers a new take on traditional sounds. He talks about the album — and about collaborating with his brother Sacha Baron Cohen on the movie Borat. Does this man look eerily familiar? The musical force behind Da Ali G Show, Borat, and the upcoming Bruno, Erran Baron Cohen (he’s Sacha’s brother) also somehow managed to find time to remake a whole collection of holiday classics just in time for the Festival of Light. Songs in the Key of Hanukkah, out today, features collaborations from world-renowned Jewish artists, including Brooklyn’s own Y-Love. Cohen spoke with Vulture recently about Yiddish rapping, the gayest CD in his collection, and what childhood games might have inspired Borat‘s naked wrestling scene. Jews of the world unite (Yes, Hasidic and Non) as ERRAN BARON COHEN the composer for BORAT: CULTURAL LEARNINGS OF AMERICA FOR MAKE BENEFIT GLORIOUS NATION OF KAZAKHSTAN and brother of the titular BORAT character SACHA BARON COHEN has “upped the ante” for Holiday music world round with his NEW LINE RECORDS release of SONGS IN THE KEY OF HANUKKAH which is available NOW!!!! Keep reading on for more information about this momentous release as well to check out the official “DREIDEL” music video featuring JULES BROOKES and Y-LOVE! New Line Records is excited to announce the recent release of Songs In The Key Of Hanukkah. 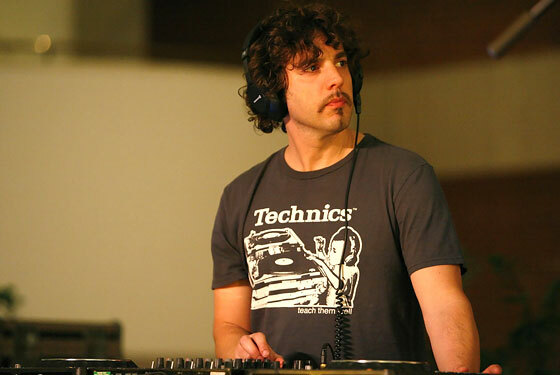 The album was created and produced by composer and multi-instrumentalist Erran Baron Cohen, brother of Ali G and Borat creator Sacha Baron Cohen. Baron Cohen scored the original music for his brother’s film, Borat: Cultural Learnings of America for Make Benefit Glorious Nation of Kazakhstan (in which he rewrote the Kazakhstani national anthem), as well as his hit TV series, Da Ali G Show, where he collaborated with the likes of Chrissie Hynde, Travis, and Supergrass among others. He has also released two internationally acclaimed records as part of his band ZOHAR, which fuses Hebrew and Arabic samples, electronic soundscapes, dub and drum and bass rhythms. “Songs In The Key Of Hanukkah is a record that takes Hanukkah music to a place it’s never been before. It’s a musical voyage that bears repeated listening both for adults and kids who will love to hear the re-workings of the songs they already know as well as the new, original tracks,” says Baron Cohen. “Hanukkah has always been a kid-focused holiday so the challenge was how to transform the music so that it was cool and interesting for adults and yet something that the whole family could enjoy.” Recorded in London, Berlin and Tel Aviv, the songs combine klezmer, reggae, electronica, hip hop, tango, pop and other genres, all fluently woven into something uniquely Baron Cohen’s. The album contains five reinterpretations of classic favorites as well as five original tunes created exclusively for this project, all sung in English, Hebrew or Ladino (Judaeo-Spanish). They are performed by some world-class Jewish singers, including Israeli superstar Idan Raichel, world-music diva Yasmin Levy and New York City-based rapper Y-Love (who actually rhymes in Yiddish!) to name but a few. The result is a record that is both meaningful AND fun. The seed for Songs In The Key Of Hanukkah was planted a year ago when New Line Records president Jason Linn went shopping for a Hanukkah record for his father. As his shopping process began, Linn quickly noticed how many Christmas records existed, yet how few there were that celebrated the Jewish holiday. He soon met Baron Cohen at the Borat premiere party and on November 18th, Songs In The Key Of Hanukkah was released on New Line Records.